Nathan Drake, some love himâ€¦ some love him even more. If you’re a super fan of a franchise that’s easily one of the best of this generation and you want even more of it in your brain, then I have some great news for you. A novel is releasing before Uncharted 3 and comic books are just around the corner. 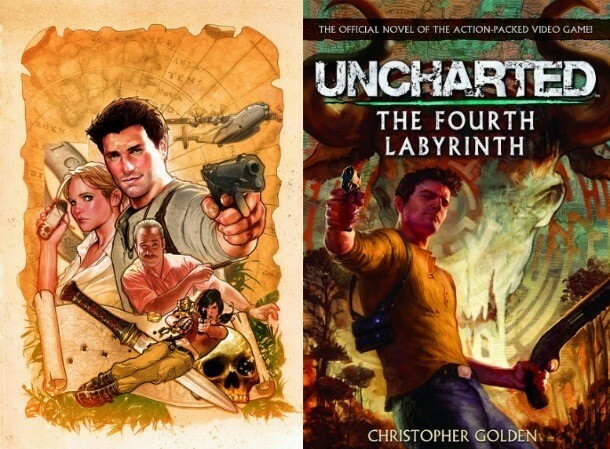 GameInformer reported that on October 4, Uncharted: The Fourth Labyrinth will become available to the world and those old-school gamers that still know how to read – because they didn’t bunk class to play online everyday – can enjoy the full novel penned by Christopher Golden, described by his own website as “Author of dark fantasies and teen thrillersâ€. Nathan Drake, treasure hunter and risk taker, has been called to New York City by the man who taught him everything about the â€œantiquities acquisition business.â€ Victor Sullivan needs Drake’s help. Sully’s old friend, a world-famous archaeologist, has just been found murdered in Manhattan. Dodging assassins, Drake, Sully, and the dead man’s daughter, Jada Hzujak, race from New York to underground excavations in Egypt and Greece. Their goal: to unravel an ancient myth of alchemy, look for three long-lost labyrinths, and find the astonishing discovery that got Jada’s father killed. It appears that a fourth labyrinth was built in another land and another cultureâ€”and within it lies a key to unmatched wealth and power. An army of terrifying lost warriors guards this underground maze. So does a monster. And what lies beyondâ€”if Drake can live long enough to reach itâ€”is both a treasure and a poison, a paradise and a hell. Ok so you’re not so into the whole â€œwordsâ€ thing and you prefer pictures instead (explanation above), so you really want to know more about the comics. Well here’s some info for you. As far as timeline, the comic book series takes place before both UNCHARTED 3: Drake’s Deception and UNCHARTED 2: Among Thieves and will find Nathan Drake discovering that the legendary Amber Room was hidden by another great explorer, Sir Richard Byrd, where legend has it that many, many years ago, Byrd hid the Amber Room in the fabled Agartha (a legendary city that is said to reside in the earth’s core, often referred to as â€œThe Hollow Earthâ€). Drake competes with a new adversary to find clues that will lead them on a journey to the center of the Earth â€” and a breathtaking new adventure. The comic series will begin on November 30th and will run for six issues (Is that cover art a little too Indiana Jones for your liking as well?). That’s just about enough Uncharted for our puny brains to handle until the PS Vita game comes out, as well as the obvious teen-drama film adaptation where Drake finds out that he has really been a vampire all along, and finds himself hopelessly in love with an incredible dull, nondescript girl from a hick town. Click through to the US Playstation Blog for all of the info.